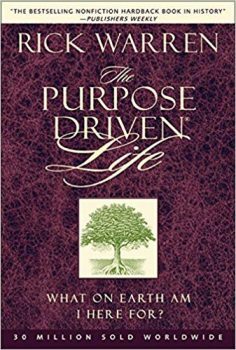 The Purpose Driven Life by Rich Warren is a Christian book answering the millennia old question “what’s the meaning of life”. It’s mostly for Christian or spiritually-leaning folks, but like most religious texts it also has some deep wisdom that is true and potentially life changing for everyone. The Purpose Drive Life has lots of Bible references and lots of Christian references. I will limit them here to tease out the insights that are of universal appeal. The author says that you didn’t create yourself, so you can’t discover the meaning of life by yourself. To understand the meaning of life you must listen to God’s word. Because you can choose career, spouse, and hobbies, but the purpose is up to God. You were created by God and for God, and it’s only God who can reveal our path. You shouldn’t ask God to help you out in this life because you should make yourself available to him, not the other way around. To find your life purpose you must open a dialogue with God and ask him. Rick Warren says that our lives is fully scripted. Were we were born, what we will do and how long we will stay on this Earth. The author says that some people make their life mission to hoard materialistic possession. That’s a bad way of give meaning to your life. The more you get, the more you will want to have and it will do nothing to make you happier, more fulfilled or more useful to the world. We are loaning everything on this earth. And you won’t be hear long, so don’t get too attached to things. Don’t get too fixated on what you see, says the author, but to what’s is unseen. It’s what is unseen that is eternal. If you want to do more, focus it. Stop dabbling, stop doing it all. This message is similar to Essentialism. What did you do with your life means deploying your gifts, talents and possibilities for something good. The author says that only a fool goes unprepared towards what will inevitably happen (eternity). You need to think about it more, not less. Everything you do, including your daily chores, has eternal implications. Live a life or worship and everything you do, do it for Jesus. How can we make God happy? When you accept God in your life you become a child of God. The church becomes your spiritual home and the other believers become your brothers and sisters. Cultivate your relationship with them. You should strive to become more like Jesus Christ and continuously develop spiritually. The author says that sheer willpower will work only in the short term. Changing the way you think will work over the long term. You are here to make a contribution and make a difference with your life. To make the best contribution you can make, you should find your strengths and passions. The above quote resonated with me very deeply. As much as you have an obligation to your brothers and sisters of the Church, you should also keep up with Jesus’ work of converting the non believers. Many people are too self-centered and too entitled. Relax. If you are a believer, it’s about God. If you are not a believer, you’re still a tiny blip in the space-time continuum. Whether your believe or not, finding your calling and dedicating yourself to it will make you happier and more fulfilled. As many Italians, I am baptized, Christened and confirmed. And I’m also a Godfather to my nephew. However, I’m not particularly religious. And albeit I’m developing my spirituality a bit more these days, I stand more on the side of reason and pragmatism. But I can tell you this: even nonreligious people can find several deep golden nuggets in The Purpose Driven Life. Indeed I believe that those who reject Jesus just on the basis of being non-religious are quite silly. At the very least, Jesus was an extraordinary, groundbreaking philosopher and a master influencer. However, I don’t feel like I can rate The Purpose Driven Life (edit: but I did rate it in the end to help people sort through my hundreds of reviews).